A beautifully crafted garment for your special occassion. After dark or 6 p.m. whichever arrives first, there are two ensembles that can properly be referred to as formal: white tie, which involves tails or black tie (more often referred to as the tuxedo). The more formal of these would be white tie, which includes a tailcoat with matching trousers trimmed with two lines of braid on the outside of each trouser leg, white pique tie, white pique single or double breasted waistcoat (vest) and a wing collar shirt with stiff pique front. However, with exception to some men's weddings or occasions of state, a man will never be required to wear white tie. With that in mind, the more common, practical choice would be the tuxedo. 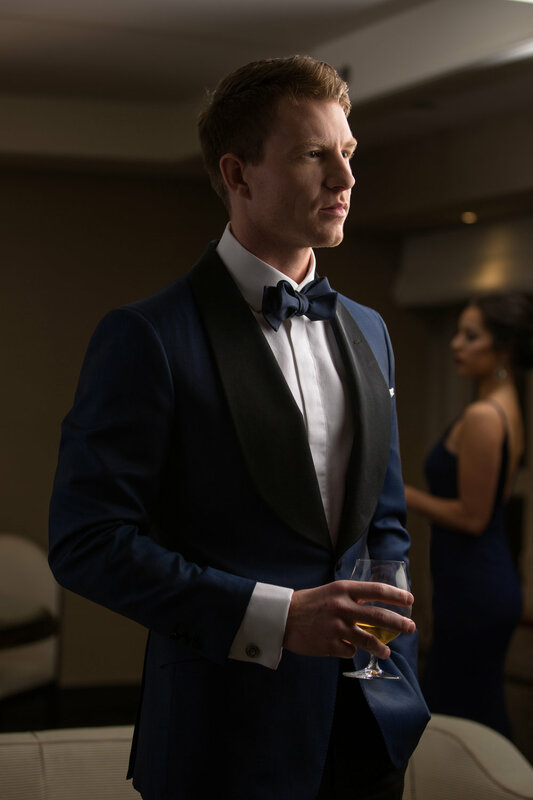 There are four proper styles for the tuxedo: the single or double breasted, one button with peaked lapel or the single breasted or double breasted shawl collar. You are also encouraged to consider your tuxedo in a chic midnight blue, black, of course, being the standard. We will build your special occasion garment with all the proper fittings and details.